This is a somewhat novel Beethoven piece - a work made up of 6 dance themes played on 2 violins and a bass, followed by a coda. Unlike the bagatelles or the contredances, this piece is supposed to be played as 1 long medley of dances. At least it seems that way to me, since there is a scored Coda at the end. I suppose this is similar to when we (use to?) go club-hopping and the DJ would spin a continuous set of beats without stopping. "A Ländler is a country dance for couples in a quick 3/4 meter that generally occurred outdoors and involved stomping and hopping. 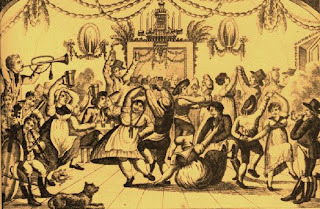 As dance halls appeared in the late eighteenth century the Ländler moved indoors and people began to wear lighter shoes and dance at a faster tempo. This led to the development of the waltz. In the Ländler, WoO 15, the melodic material of the dances is all given to the violins, most of it to the first violin. Unlike the later waltz, Ländler melodies are generally active on each beat of the measure, the accents occurring in the accompaniment. Several rhythmic patterns occur in the traditional Ländler and most are represented in Beethoven's Ländler, WoO. 15. For instance, the first two dances are dominated by a half-note, quarter-note pattern, producing a long-short rhythm in the accompaniment. The third dance combines the long-short pattern with measures giving equal stress to each beat, while the fourth dance features a short-long pattern. A rising triplet in the first violin accents the third beat in No. 5 before moving on to superimpose a duple meter on the clear triple meter of the bass and second violin. The coda is really an extension of the sixth dance, giving Beethoven a chance to flex his developmental muscles. The fact that all the dances are in D major (except No. 4, in D minor) suggests they were meant to be played without a break."